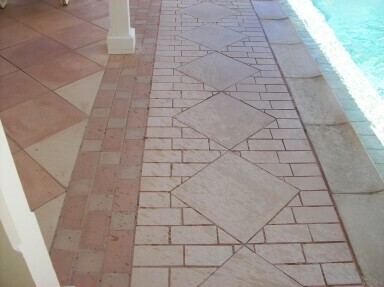 Exterior stone finish tile patio, designed and installed by M Carr. Our custom made laminated concrete tile are available in more than 25 sizes, which can be one of four textures, with custom colors mixed to match your palette. 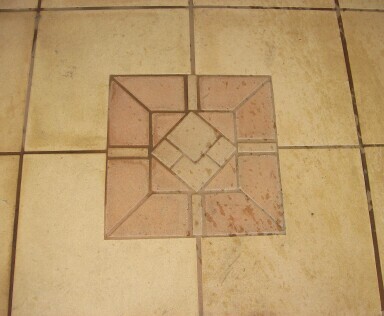 Because we make our own molds, we can design any style of tile pattern you wish, in any size. 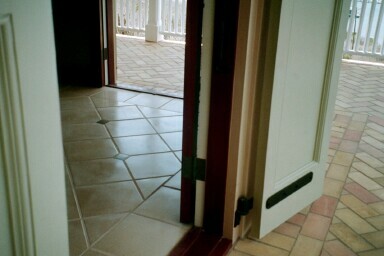 Craftsman style, Art Nouveau borders, Geometrics, your style....all in durable concrete. 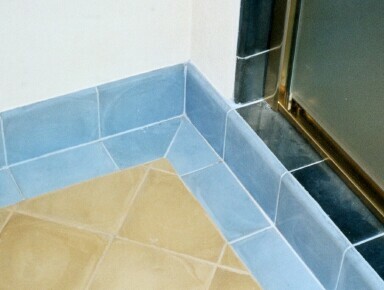 Please see Products and Price Lists for a complete list of readily available molded tile sizes; we also custom make molds to your specifications. 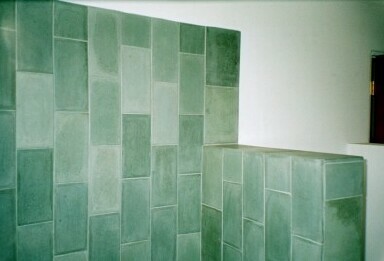 Our wall tile are available in 6 X 6, 6 X 8 bullnose, 8 X 8, 6 X 12 and 12 X 12. 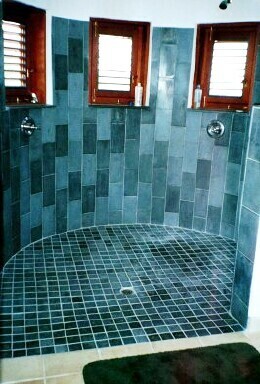 We also have details of 3 X 3 for shower floors, and a 1 X 8 pencil moulding. Our often used 12" tile molds are now antiques, as they have been in constant use for 39 years. 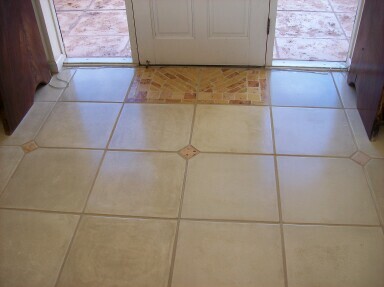 The nice rolled edge makes the tile easy to grout; their slight differences make them obviously hand made. A favorite pattern uses a 3" square in the middle of every four tile; and adding a straight border around the edge of the room with a diagonal field in the center makes uneven walls and odd corners seem much easier on the eyes. 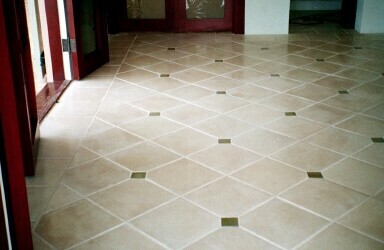 For larger rooms, our 18" tile with small details of 3" tile in the corners can make any great room more elegant. 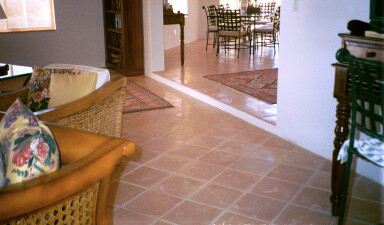 We can use an off white for the main floor, and spice up your decor with details of something brighter. The possibilities are endless. 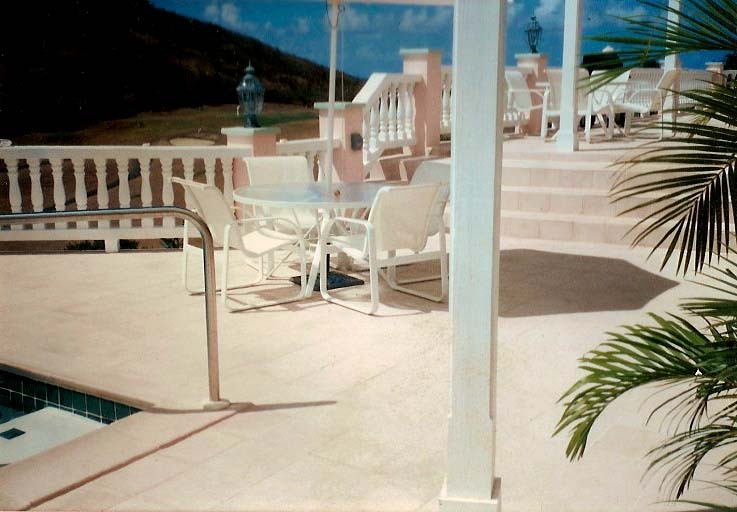 In the 1960's many homes on St. Croix were built using our large 24" tile throughout the interior and exterior spaces. These were laid on a sand and cement bed after all the rest of the house was built, with all the mechanicals under the floors. Some of these old interior tile have achieved a patina much like translucent bone china; it is difficult to believe you are looking at concrete. Despite the recent popularity of concrete counter tops, we have yet to see anyone duplicate this glowing patina with any concrete products anywhere. 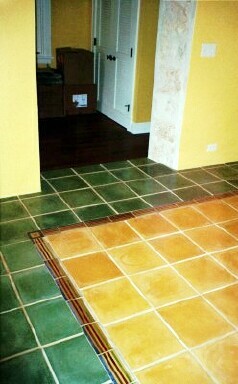 18 X 18 parchment tile with 3 X 3 details of antique Danish brick, and an 18 X 18 welcome mat also of antique Danish brick. 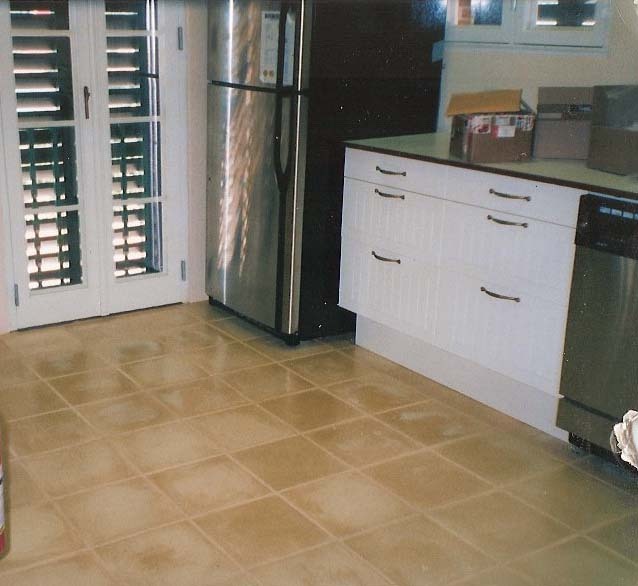 All of the molds we have can also make exterior tile, in three different slip-resistant textures. Our rougher textures, in swirls of roughness or in random crevices, are intended to resemble either travertine marble, where the escaping gases left fissures as the stone solidified under tons of pressure and eons of time; or coral stone slabs, with smaller crevices left by long gone sea creatures. 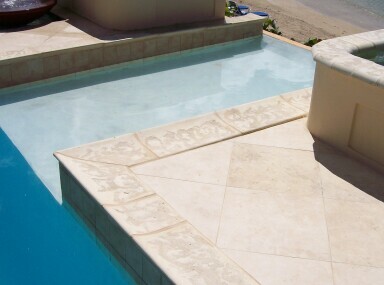 The stone finish texture resembles limestone finishes commonly used in fine exterior stonework throughout the world. This finish is more homogeneous, and actually makes the concrete look soft and comfortable; definitely an interesting effect. It is also easier to keep clean, after it has been properly sealed. 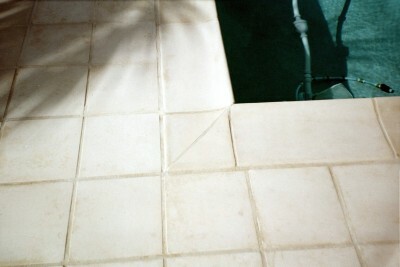 Many pools are designed to use a large tile along the edge to provide a hand-hold to those in the pool, and to stop the patio water run off from getting into the pool. 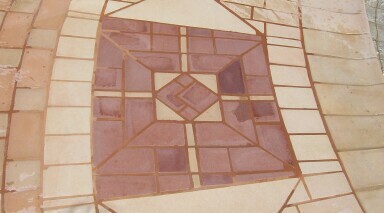 We have two different shapes available, and have also made molds for different brick profiles to match our brick patios. 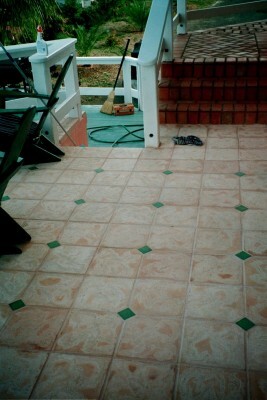 These are available in colors and textures to complement your patio tile, or can be a contrasting color and texture.